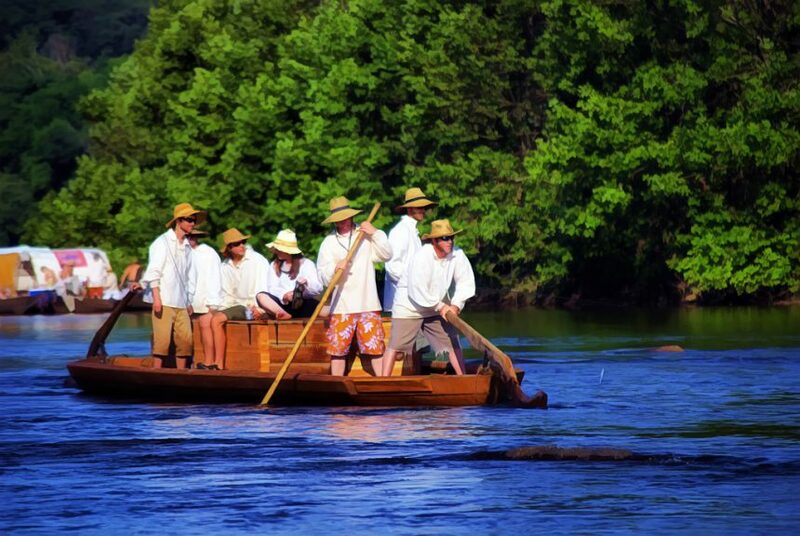 The James River Batteau Festival depends on the generosity of numerous landowners to make this event possible. It is absolutely crucial that we respect and take care of the properties that are made available for our use. The JRBF respectfully requests that you support the food vendors as much as possible. They are crucial to many participants!!!! A brochure in PDF format is available for download at www.batteau.org. It gives general info about the festival including brief descriptions of each river day. It also has a map showing festival stops and a simplified road map between each stop. Camping for Non-Batteau crew is available and we ask for a $5.00 donation per night or $25.00 per week. The camping fee can be paid on site at the T-shirt booth. We ask for this voluntary payment to help defray the significant expenses of putting on the festival. Batteau Crew are covered by the fee each batteau pays to participate. Portable toilets are available at all sites for your enjoyment! Consider bringing paper! Water is available at Bent Creek, Wingina, Howardsville, Scottsville, and Slate River. Some places it is provided by the site, some by the festival, you should figure on carrying a 2 day supply of water and renewing supplies everywhere it is available. Ice will be available at each site either at stores within walking distance or by the festival ice trailer. Where Ice is provided by the festival it is on a first come first served basis for sale in the AM while limited supplies last. It is difficult to obtain the volume of ice needed and impossible to predict the exact amount needed, so please buy only what you absolutely need and be flexible. Trash will be picked up at all sites. Some places the county provides dumpsters, and at some sites the Batteau Festival will have a trailer. Please bring your trash to the location where it is being collected and help us leave the property cleaner then when we arrived. Membership in the VCNS (Virginia Canals and Navigations Society) is strongly encouraged of everyone who enjoys the James River and Batteau Festival. The VCNS is the parent organization for the JRBF, and without it there will be no Batteau Festival. Membership forms are available at the T-Shirt booth.